as well as certain state-based aid. FAFSA every year the student is in college. scams. 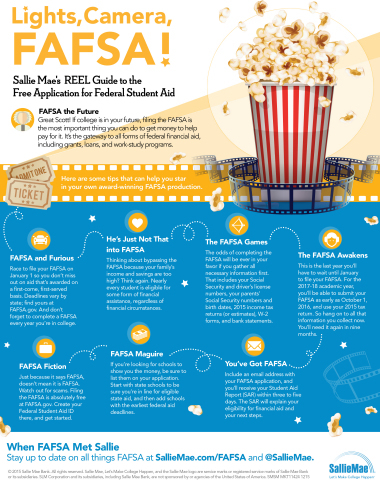 Filing the FAFSA is absolutely free at FAFSA.gov. Create a Federal Student Aid ID there, and get started. explain eligibility for financial aid and next steps. gather all the information and keep it handy. your education,” said Martha Holler, senior vice president, Sallie Mae. or follow us on Twitter @SallieMae. and, third, consider a responsible private education loan.